For the second time in eight years, the Buckeye State is poised to offer the decisive electoral votes to reelect an incumbent president. The polls show Obama with a lead of around 2 or 3 points, enough to make him a favorite but not enough to assure victory, especially since he remains beneath 49 percent of the vote. At first glance, Obama’s resilience in the Buckeye State seems to defy partisan history and demographics. It’s about the only state where Obama is doing so well where his chances depend on maintaining gains among white working-class voters who voted for Bush in 2004. But Obama’s success among African Americans and postgraduates has shifted the state toward Democrats, forcing Romney to compensate with white working class Kerry voters. And although there are clear opportunities for Romney to make gains in southern and southeastern Ohio, the Obama campaign’s strategy is perfectly suited to deny him the gains he needs. Obama’s road to victory in Ohio starts with a strong showing among the African American voters that helped Bush win reelection eight years ago but voted for Obama in '08. It's often overlooked just how much Obama gains over Kerry’s performance just by winning an outsized share of Ohio's African American voters. According to the 2004 exit polls, Bush’s concerted efforts to appeal to African American voters—mainly on cultural issues—held Kerry to just 84 percent of the black vote. African American voters predictably swung decisively toward Obama, offering him 97 percent of the vote on Election Day with an additional point of black turnout. In 2004, Bush won Ohio by 118,000 votes, but Obama’s gains among African American voters are sufficient to erase Kerry’s deficit without any changes in the composition of the electorate. The exit polls show that approximately 550,000 African American voters cast ballots in Ohio and offered Kerry a margin of approximately 380,000 votes. If Kerry had won 97 percent of the black vote, as Obama did, then Kerry would have won black voters by a 530,000 vote margin. Thus, changes in black vote preference alone is sufficient to swing Ohio by 150,000 votes—enough to overcome Bush’s 118,000 vote victory. Obama makes additional gains from increased African American turnout. The 2008 exit polls showed African Americans increasing from 10 percent in 2004 to 11 percent in 2012, increasing his margin among African Americans by an additional 60,000 votes. If Obama can maintain elevated black turnout and support, he would transform Kerry’s 118,000 vote deficit into a 92,000 vote lead without persuading a single white Bush voter. These numbers aren’t exact, but they do show that Obama’s support among African Americans is enough to turn a lean-Republican state like Ohio into a true toss-up that might even tilt-Democratic without commensurate losses among white voters. Obama ultimately won by 262,000 voters in Ohio and many of his additional gains came from rural northwest Ohio and the Columbus metropolitan area. Like many other white, moderate, but traditionally Republican areas in the northwestern part of the country (think Indiana, northeast Wisconsin, North Dakota), Obama’s performance in many parts of rural northwest Ohio was the best by any Democrat since 1964. Obama’s gains in the relatively affluent and well-educated Columbus metropolitan area were similar to his gains in other post-industrial metropolitan areas like Raleigh, Washington, and Denver—Bush won Ohio’s postgraduate voters by 2 points in 2004, but Obama would win them by 10 points. These gains were felt most clearly in Columbus, where Obama netted an additional 65,000 votes over Kerry’s performance. Elsewhere in Ohio, Obama made relatively small gains with white voters and actually did worse than Kerry in the Mahoning and Ohio River valleys of southeastern Ohio. But these losses weren’t nearly enough to overcome Obama’s huge gains in northwest Ohio, Columbus, and among African Americans. Romney’s road to victory starts by undoing Obama’s gains in rural northwest Ohio, where Obama outperformed reasonable Democratic benchmarks by a substantial margin. But Obama seems likely to hold onto many of his gains Franklin County and African Americans, leaving Romney with a deficit in the state. Resurgent Republican enthusiasm can probably make up some ground, but Romney would still need to persuade plenty of white Kerry or Obama voters to overcome persistent Democratic strength in Franklin County and among African Americans, where Obama is all but assured to outperform Kerry’s total. Where can the Romney campaign make up ground among Kerry voters? His best chance is the traditionally Democratic stretch of southern and southeastern Ohio, where Democrats long held the allegiance of working class voters tied to the coal industry. If you’ve been wondering why Romney likes talking about coal so much, this is why: there are many socially conservative but Democratic-leaning voters in southeastern Ohio who have never especially liked the president and where the so-called ‘war on coal’ is a pocket book issue. If one excludes the northern cities of Akron, Canton, Youngstown, and Warren, the coal producing stretch of Ohio holds nearly 700,000 voters or about 12 percent of the Ohio electorate. Obama only won 45 percent of the vote in this traditionally Democratic but socially conservative region, but that still leaves plenty of room for Romney to make additional gains. If Romney could reduce Obama’s share of the vote to 40 percent, he would net 75,000 additional votes. Smaller gains across the rest of Ohio, where Obama picked up support over Kerry’s performance, could plausibly put him over the top. But coal country is not populous enough for anything short of big gains to flip the state. But Romney isn’t assured of the gains necessary to overcome Obama’s advantage in the big cities. In 2008, Obama performed poorly in the industrial northeastern part of Ohio, but it’s conceivable that he could match or even exceed his ’08 totals in places like Youngstown, where Obama did worse than Kerry and the auto-bailout and shale oil boom have rejuvenated a struggling manufacturing hub. The Obama campaign has attacked Romney for arguing that a Massachusetts coal plant “kills,” undermining Romney’s ability to completely exploit the so-called ‘war on coal.” And Obama’s broader strategy to depict Romney as an out of touch plutocrat bent on outsourcing middle class jobs resonates across eastern and southeastern Ohio. These populist and working class areas were once Democratic for a reason and the Obama campaign’s caricature of Romney helps remind them why. Romney will still do better than McCain in southern and southeast Ohio, but “better” isn’t enough, with Obama starting well above Kerry’s performance among African Americans and postgraduate voters around Columbus. 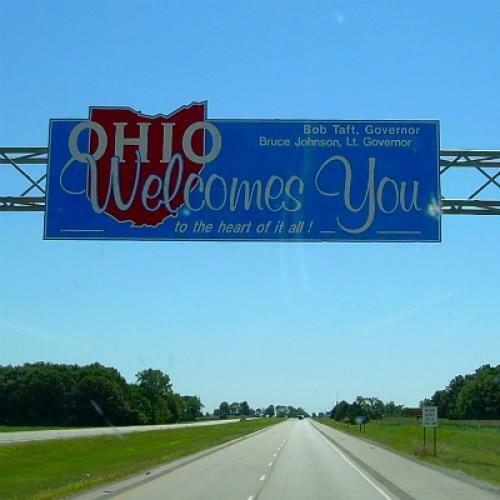 Absent a strong enough counter-veiling force, Obama’s improvements among these two groups are sufficient to overcome Ohio’s traditional Republican-lean. To compensate, Romney needs to run up the score among voters who have traditionally voted for Democrats in southern and southeast Ohio, but the Obama campaign has developed a messaging strategy perfectly suited to blocking his route to victory. With twelve days to go, the polls show that the Obama campaign’s approach is succeeding.